Microbiology as a subject imparts knowledge about various microorganisms as a causative factor for inducing a disease. 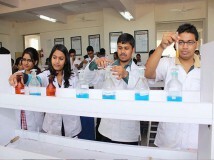 Department of Microbiology functions in two division’s mainly Clinical microbiology and Academics. Department of Microbiology of Jagannath Gupta Institute of Medical Sciences & Hospital is a multidisciplinary unit consisting of Bacteriology, Virology, Mycology, Anaerobic bacteriology, Immunology, Parasitology, Mycobacteria and Serology section. The department is well equipped with adequate academic resources, spacious lecture halls, museum and laboratory and departmental library. Teaching is an integral part of the departmental academic activity. The department offers excellent opportunities for research in infectious diseases.